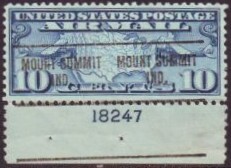 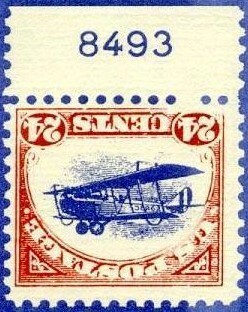 A plate number single of this stamp does not actually exist. 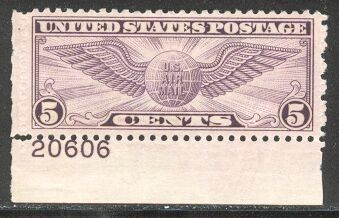 The sole plate block from the unique sheet has been preserved intact. 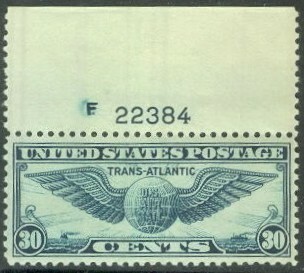 The above image is a mock-up of what a Scott C3a plate single might look like. 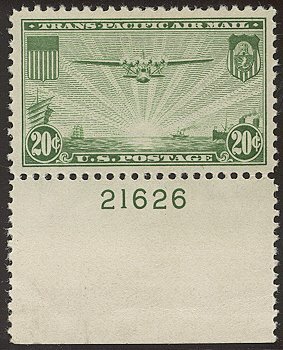 It was created by a former APNSS Secretary, the late Tom Yano, and was used as an eye-catcher and as part of the APNSS logo for some years. 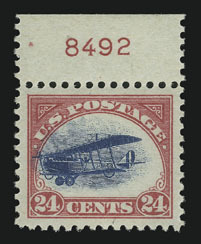 Scott C3a, 24¢ frame inverted error, blue plate number 8493, photographically cropped from the unique plate block of 4. 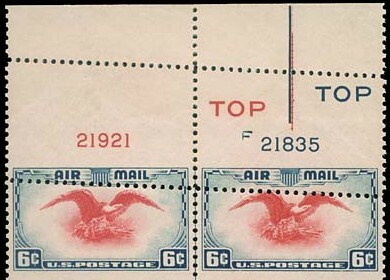 No red plate number appeared on the original sheet. 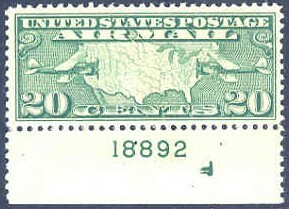 Scott C9 var, 20¢, Plate Number F18892 B. 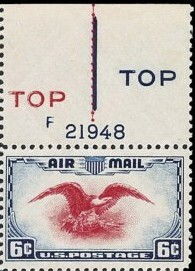 On this plate, the "F" appeared in both the normal Top Right position as well as inverted in the Lower Left position as in this example. 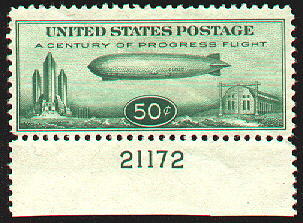 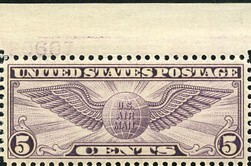 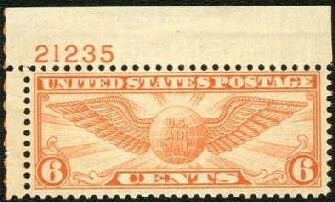 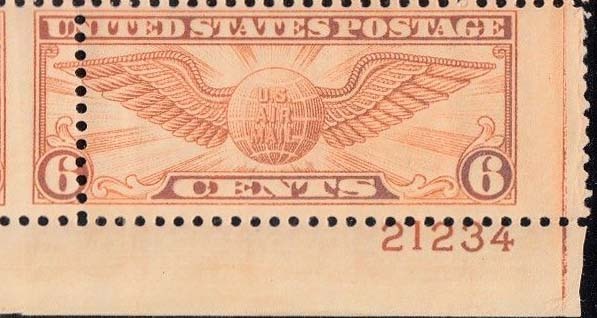 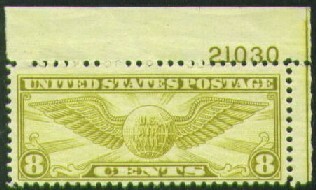 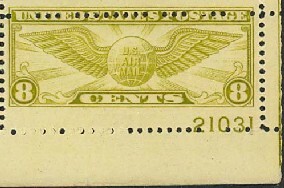 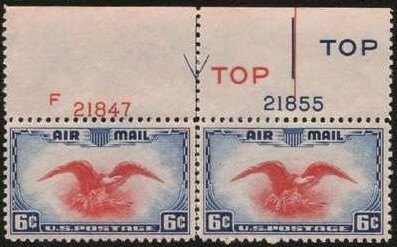 Scott C25a, 6¢, misperfed, plate number 22980. 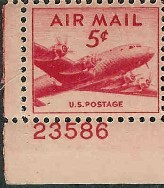 Image courtesy of Doug D'Avino. 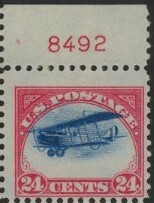 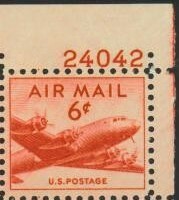 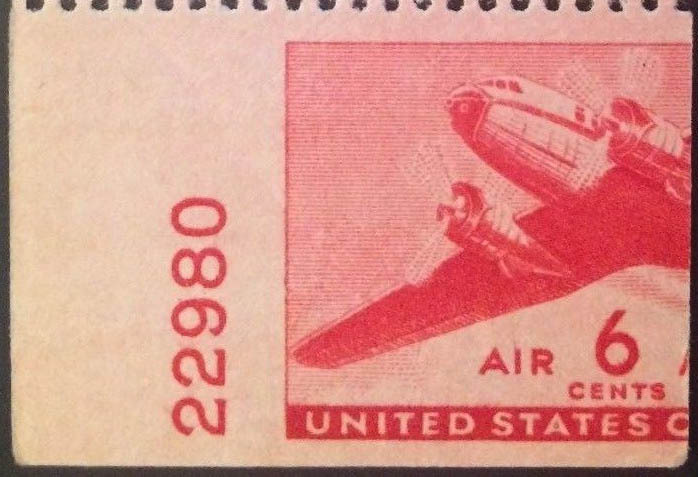 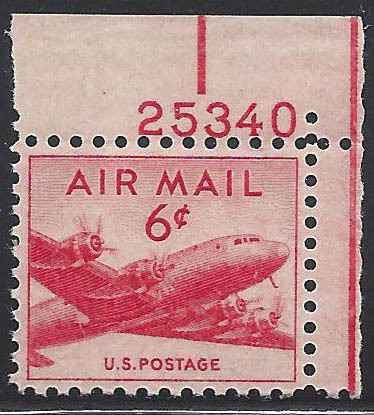 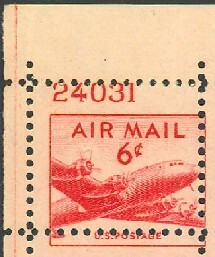 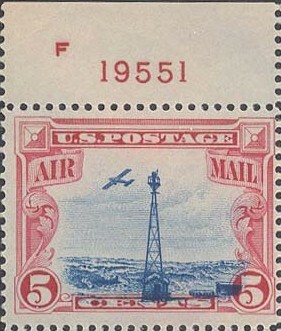 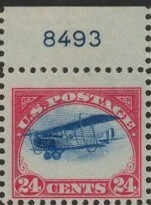 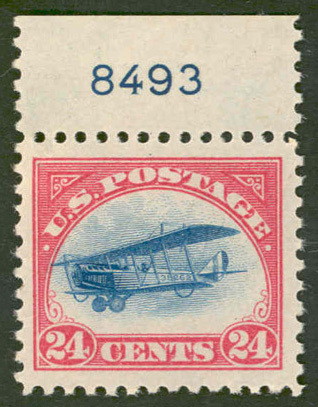 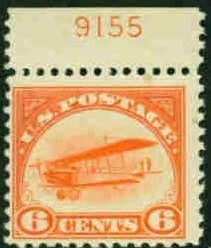 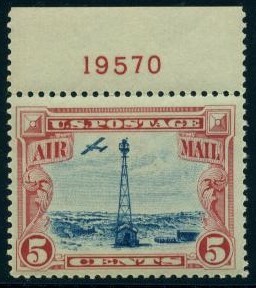 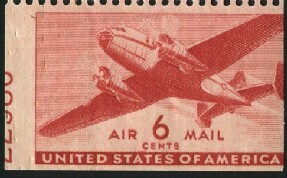 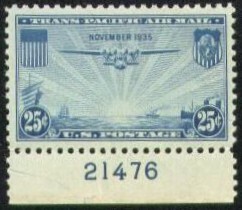 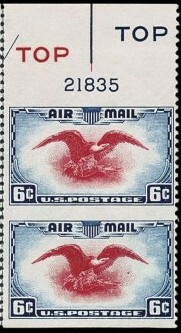 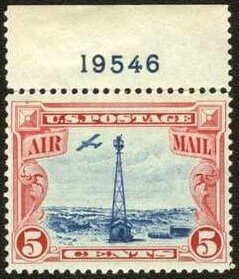 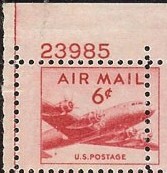 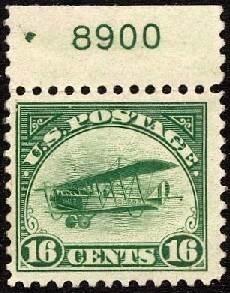 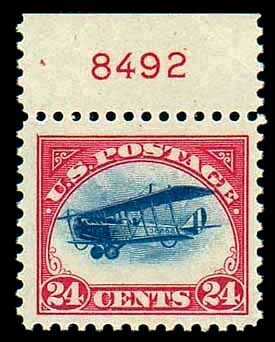 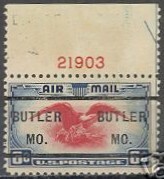 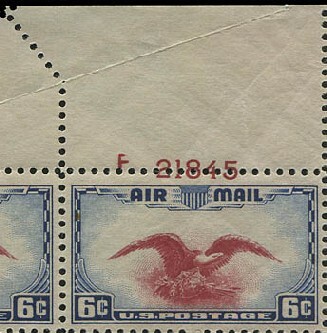 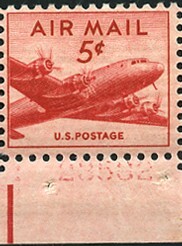 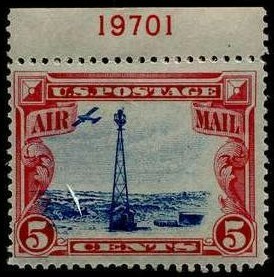 Most airmail stamps that picture an airplane use a real plane. 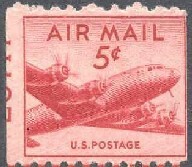 For the "Transport" issue, the plane is a mock-up of various features from different planes and manufacturers. 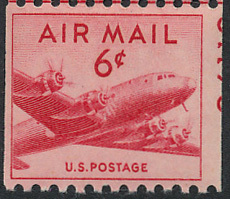 The tri-tail, for example, is borrowed from the Lockheed Constellation. 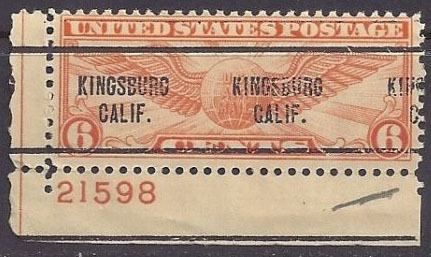 This page last updated November 8, 2018.